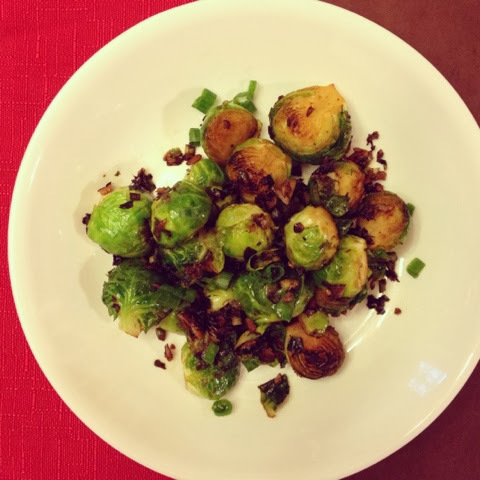 To make simply sauté up halved brussels sprouts in olive oil, soy sauce, garlic and scallions. Gorgeous and super healthy! Brussels sprouts are loaded with antioxidants, fiber and are even believed to protect us against cardiovascular disease and certain cancers. Um, seconds please! 1. Add olive oil to skillet over medium heat. 2. 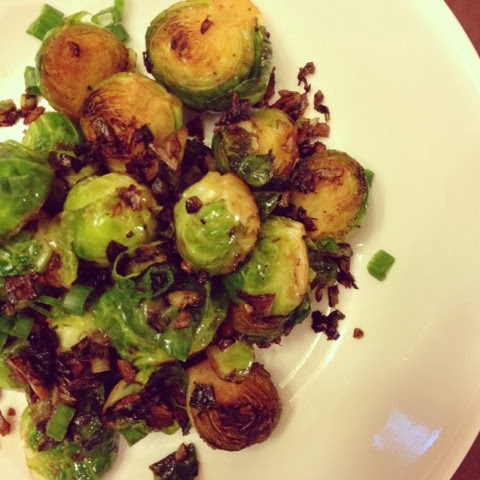 Add garlic, most of scallions & brussels sprouts to pan - sauté for 2-3 minutes until begin to brown. 3. Add non-stick olive oil spray (reminder - do not spray non-stick spray over stove if you have a gas burner, it will ignite!) & soy sauce and continue to sauté for another 2-3 minutes. Season with pepper to taste. 4. Remove from heat and top with additional scallions. Serves 2 healthy portions! Enjoy!